Thank you Pinterest! Yup, once again you have saved me the time and stress of having to find an easy but beautiful gift idea. 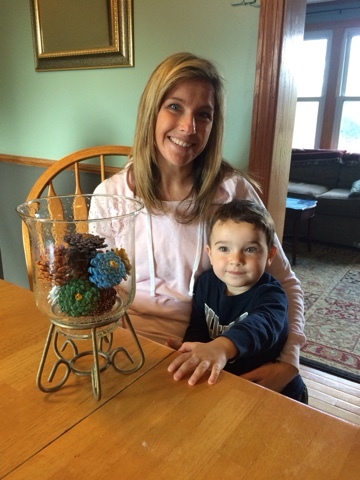 This time one for my grandson to make and give to his Mom on Mother's Day! Let's face it...don't we all have enough "little hand print art" already? Ok, I'll speak for myself....YES. 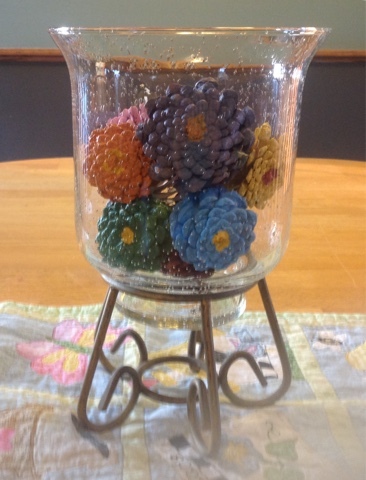 A few weeks ago the Painted Pine Cone Zinnia project came up for me on Pinterest as the recommended "Pin". I was stunned at the beauty and realism of this simple project, and since I have a bucket of pine cones at my disposal and a Finally Finishing list of things to complete, I put the two together and went to work . I had the paint, the paint brushes and of course the 2-1/2 year old grandson. Little Drew wanted to do it himself and he did. Oh, while he was at it he also painted the the table, the chair, and himself. One of the best moms I know!